PAPUA New Guinea PMXIII coach Michael Marum says their defense alignment will have to be tight-knit against the powerful Australian side. Marum didn’t hide the fact that the Australian PM’s XIII side has a strong forward pack, but was confident his charges are warming up to the battle and are set to put their bodies on the line for their country. The annual PM’s XIII bash is set for Saturday at 3pm at the National Football Stadium. 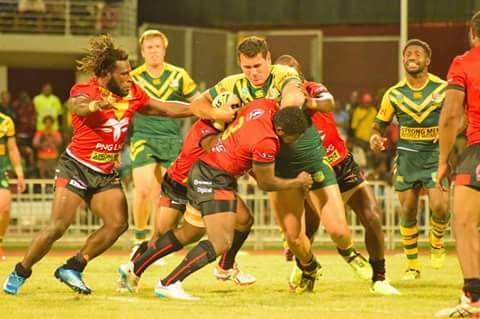 “The squad made up mostly of Digicel Cup and PNG Hunters players will play their hearts out against what I see as a genuine Australian Kangaroos side on Saturday. “Our focus is to start strong defensively and to ensure we make full use of the ball in hand,” he said. Marum said despite having several debutants he said they should fit in well with the show of maturity and confidence shown already in training. When asked about the team’s lead up preparation, Marum said everything is going well with the game-plan hinged on the Lae Tigers combination of Noel Joel and Kalas Mafu working in tandem with Hunters Ase Boas and Wartovo Puara Jr.
“Otherwise all is good,” he added. “This might not be a Kumuls representative game but I believe the boys will show pride and passion for their country,” said Marum. Marum also made it clear that the absence of NRL based players David Mead, Nene McDonald and Rhys Martin is understandable as they have commitment towards settling down with their newly contracted NRL teams. “We respect their decision,” he added. The absence of coaching staff like John Wilshere and Marcus Bais was also clarified by Marum as due to work commitments. The PNG PM’s XIII captain will be named on Friday night during the official jersey presentation by the office of the PNG Prime Minister. The 20 man squad: Bland Abavu, Ila Alu, Bagave Yoks, Anderson Benford, Konnie Bernard, Ase Boas, Bradley Brawa, Bernard Goma, Noel Joel, Mafu Kalas, Muka Peter Kulu, David Loko, Willie Minoga, Butler Morris, Justin Olam, Kingston Paul, Brandy Peter, Wartovo Puara Jnr, Junior Rop and Esau Siune.